A federal judge on Wednesday declared a mistrial in the Notorious B.I.G. wrongful death case, attorneys on both sides said. U.S. District Judge Florence-Marie Cooper's ruling came after she expressed concern at a hearing Tuesday that the Los Angeles Police Department had deliberately withheld evidence from the court. There were only three days of testimony in the trial, which began June 21 but was interrupted when an anonymous tip led to the discovery of large numbers of LAPD documents that hadn't been turned over to attorneys for the rap star's family. 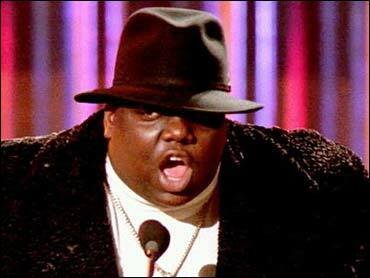 B.I.G., born Christopher Wallace, was 24 when he was gunned down in 1997 while leaving a crowded late-night party in Los Angeles. He was one of the most influential hip-hop artists of the 1990s and his two albums are regularly listed among the best in the genre. His family's lawsuit against the city and LAPD claimed corrupt police officer David Mack arranged to have Wallace killed at the behest of Death Row Records founder Marion "Suge" Knight, and that LAPD officials covered up Mack's involvement. Family attorneys had declared their intention to refile the suit with new allegations against the LAPD and against Mack's one-time partner, Rafael Perez. The city had previously asked the judge to continue with trial, arguing that any new documents largely revolved around hearsay. Assistant City Attorney Don Vincent said Wednesday he would still like "to try the case on the merits." Family attorney Perry Sanders Jr. said the family — including Wallace's mother Voletta and widow R&B singer Faith Evans — didn't want to have to go through another trial but would do so. He said the case would now delve into a corruption scandal in the LAPD's Rampart division dating to the 1990s. "We're about to get to the bottom of Rampart," Sanders said. "We're about to peel the onion back to its rotten core." Perez was a central figure in the scandal, which involved alleged misconduct or brutality by corrupt officers in an anti-gang unit at Rampart. More than 100 criminal convictions possibly tainted by police misconduct were reversed. Perez alleged wrongdoing by others after he was found to have stolen cocaine from an evidence room. Perez was the focus of most of the recently discovered documents, which had been sitting in an LAPD detective's desk drawer until last month. The detective said he forgot about them, a claim the judge called "absolutely incredible" during Tuesday's hearing. The plaintiffs filed a motion Tuesday seeking a mistrial based on what they claimed was deliberate concealment of evidence and on the need for time to further investigate Perez. The court did not immediately make the mistrial ruling public. A written ruling will be issued Thursday, the judge's clerk said in confirming the mistrial. Perez and Knight have never been arrested or charged in connection with the slaying and were not named in the family's suit. Mack, now serving a prison term for bank robbery, and a man alleged by the plaintiffs to be the shooter, Amir Muhammad, had been named in the suit but were dropped before trial. They also were never arrested or charged in connection with the killing.